In German-speaking modernity, Robert Musil may lay the last valid claim to the title of Universalgenie. Trained as a soldier, engineer, philosopher, and psychologist, he did not shy from investigations beyond his accredited purview. His work repurposes the conceptual inventories of literature, philosophy, science, law, medicine, politics, education, etc. to revisit classical questions of beauty, truth, and morality within an ultra-complex modern context. The answers he finds are not conclusive but suggestive and always invite re-examination. Musil studies, at its best, embraces his practice of multivalent inquiry, and the present essay collection endeavors to follow suit. 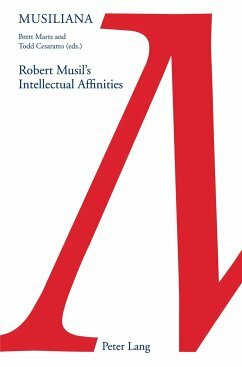 Drawing from Musil's fiction, essays, letters, diaries, and public addresses, the authors of this volume offer unexpected treatments of ideas that Musil examined and reveal previously overlooked links between those ideas and other authors, works, and movements. The contributions have a footing in fields such as psychology, sociology, and statistics; cover concepts like humor, identity, and love; and deal with literary epochs or theories ranging from Romanticism and Modernity to decadence and reader response. Brett Martz is an Assistant Professor of German and Program Coordinator of Modern Languages at Longwood University in Farmville, Virginia. He serves as the current president of the Virginia Chapter of the American Association of Teachers of German. He has published or presented on reader response as well as the relationships between literature and science. Todd Cesaratto moved to Vienna, after two Visiting Assistant Professorships in the U.S., to work as Senior Communications Manager for Mondi, a global packaging and paper company. Walking the streets Musil once did, he continues writing about the positive outcomes that a sense of possibility, humor, and heroism make possible.